Julia Tutwiler, Vivian Malone Jones and Marillyn Hewson will be among those honored during the 1893 Jubilee Dinner. 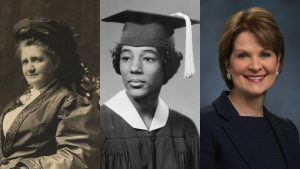 TUSCALOOSA, Ala. — The University of Alabama will honor 20 female trailblazers during the 1893 Jubilee Dinner that will be held at the John and Ann Rhoads Softball Stadium Sept. 7 at 6:30 p.m. The 1893 Jubilee Dinner is the signature event of the University’s 125 Years of Women yearlong celebration of the contributions UA women have made to the campus, nation and world. Aside from dinner, the event will include recognitions by UA President Stuart R. Bell and his wife, Susan, who is serving as honorary chair of the 125 Years of Women organizing committee; a video highlighting all trailblazers; and a grand finale. The trailblazers will be honored throughout the event. The women were selected based on their accomplishments on campus or in their respective fields following their time at UA. “The 1893 Jubilee will be a night that commemorates the achievements of the past and shines a spotlight on the bright future of women at The University of Alabama,” said Caldwell. Biographies of trailblazers and their category of recognition are below. In 2014, as the first woman to serve as president pro tempore of the Board of Trustees of The University of Alabama, Karen Phifer Brooks blazed a trail for all women in administration at UA. As the presiding officer of the board, Brooks led the board of trustees in their mission to ensure the effective leadership, management and control of the institutions of the UA System. As the vice president and treasurer of Phifer Inc., Brooks is co-chairman of the company’s board of directors. Under the leadership of Brooks and her sisters, Phifer Inc. is a global company with its roots firmly planted in Tuscaloosa. In 1956 Autherine Lucy Foster became the first African American student to attend The University of Alabama. Although she was accepted in 1952, her admittance was rescinded when it was discovered she was not white. Backed by the NAACP, she charged UA with racial discrimination in a court case that took almost three years to resolve. On June 29, 1955, the NAACP secured a court order preventing the University from rejecting her admission application. On Feb. 3, 1956, Lucy attended her first class as a graduate student in library science, becoming the first African American ever admitted to a white public school or university in Alabama. Campus riots broke out three days later, and the University removed Lucy for her own safety. Her expulsion was officially annulled in 1988. A year later, she again enrolled at the University, joining her daughter, Grazia Foster, who was also a student at the Capstone by that time. They graduated together in 1992 with Autherine earning a master’s degree in elementary education and Grazia earning a bachelor’s degree in corporate finance. The University named an endowed fellowship in her honor that year and dedicated the Autherine Lucy Clock Tower in 2010, honoring her as one of three individuals who pioneered desegregation at The University of Alabama. In 2017, Foster was honored with the Autherine Lucy Foster marker, located in front of Graves Hall. Janet Gurwitch co-founded Gurwitch Products in 1995 and launched the Laura Mercier Cosmetics line in 1996. She began her career at Foley’s department store in Houston, Texas, finishing as senior vice president of merchandising, before moving to Neiman Marcus as executive vice president. She co-founded her company to market a boutique line of cosmetics bearing the name of French makeup artist Laura Mercier. She sold Laura Mercier to Alticor in 2006. She is a partner at Castanea Partners, a Boston-based equity firm, where she serves on the board of Drybar and First Aid Beauty. She was also on the board of directors of La-Z-Boy and Urban Decay. Gurwitch is an investor in, and serves on the board of, the Houston Astros baseball team. She received a bachelor’s degree in fashion retailing from The University of Alabama. Libby Anderson Cater Halaby was elected vice president of the UA Student Government Association in 1945, but upon the resignation of the president, became the first female SGA president at The University of Alabama. Throughout her notable career, she has thrown open doors for women in America as she served as special assistant to former first lady Claudia “Lady Bird” Johnson, assistant to the president of the National Endowment for the Arts, and assistant executive director for President Jimmy Carter’s Commission on Women, among other positions. The Anderson Society was created at UA in honor of Halaby in 1974, and the organization continues as the most exclusive honor society on campus and recognizes individuals who have made significant contributions to the Capstone. A graduate of The University of Alabama with a Bachelor of Science from the Culverhouse College of Business, Lynn Yeldell majored in finance, minored in economics and, continuing in Halaby’s legacy, was the first woman to be elected president of the SGA in 1989. An active member of the Austin, Texas, community, Yeldell founded L Style G Style, with the mission of telling stories of the LGBT community to break down barriers, open hearts and change attitudes. She oversees all marketing, social media, publishing and content of this niche media company, which has been in continuous operation since 2006. Leveraging the successes garnered running her own company as well as investing and advising numerous startups, Yeldell is a recognized consultant with expertise in strategic and market planning. Named Chief Executive magazine’s 2018 CEO of the Year and named third on Fortune magazine’s Most Powerful Women list for 2016 and 2017, Marillyn Hewson is chairman, president and chief executive officer of Lockheed Martin Corp., where she has worked for more than 35 years. She also serves on the board of directors of DowDuPont, and she is a member of the executive committee of the Aerospace Industries Association. Hewson is on the board of directors of the Congressional Medal of Honor Foundation, the board of governors of the USO, and the board of visitors of UA’s Culverhouse College of Business. Hewson earned a bachelor’s degree in business administration and a master’s degree in economics from UA. Forbes magazine ranked her No. 22 on its list of Power Women for 2017. In July, she made the largest one-time financial contribution to The University of Alabama. In April 2016 Vicki Hollub became the first female CEO of a major U.S. oil and gas company when she was named president and chief executive officer of Houston-based Occidental Petroleum Corp. She has worked at Occidental since 1981, and she was previously president and chief operating officer, where she managed Occidental’s worldwide oil and gas operations, as well as the company’s chemicals and midstream operations. She has held a variety of positions on three continents, including roles in Russia, Venezuela, Ecuador and the United States. She is a 1981 graduate of The University of Alabama, earning a bachelor’s degree in mineral engineering. Vivian Malone Jones was one of the first two African American students to attend UA and the University’s first African American graduate. In 1963, she and James Hood arrived on campus with the intention to enroll. Waiting for them and blocking the entrance to Foster Auditorium was Gov. George Wallace. President John F. Kennedy eventually forced Wallace to permit their entry to the University. Malone was accepted as a junior and graduated in 1965 with a bachelor’s degree in business management. She later worked at the U.S. Department of Justice, the U.S. Veterans Administration and the U.S. Environmental Protection Agency, and she became executive director of the Voter Education Project. In 2000, The University of Alabama bestowed on her an honorary Doctor of Humane Letters. She passed away in 2005. A native of Eutaw, Alabama, Dianne Kirksey-Floyd enrolled at The University of Alabama in 1967 majoring in theater. A natural student leader, Kirksey-Floyd was the founder of the African American Association (now known as the Black Student Union), which celebrated its 50th anniversary on campus this past spring. In 1968 Kirksey-Floyd became the first African American Bama Belle and in 1969 the first African American member of the homecoming court. In 2003, Kirksey-Floyd was named as one of UA’s Pioneers for Opening Doors. Today, Kirksey-Floyd is an actress, playwright and director, whose acting credits include performances in stage, screen, television and, most recently, Ron Milner’s “Urban Transitions: Loose Blossoms,” and she has written and directed for Broadway. She has also served as a public school teacher in New York City. Nelle Harper Lee, better known by her pen name Harper Lee, was an American novelist widely known for “To Kill a Mockingbird,” published in 1960. Immediately successful, it won the 1961 Pulitzer Prize and has become a classic of modern American literature. Though Lee had only published this single book, in 2007 she was awarded the Presidential Medal of Freedom for her contribution to literature. She was also known for assisting her close friend Truman Capote in his research for the book “In Cold Blood” (1966). Capote was the basis for the character Dill in “To Kill a Mockingbird.” Another novel, “Go Set a Watchman,” was written in the mid-1950s and published in 2015 as a sequel, though it was later confirmed to be the first draft of “To Kill a Mockingbird.” Lee studied law at UA for several years and served as editor of the campus newspaper, but did not finish her degree. Lee received an honorary doctorate from the UA College of Arts and Sciences in 1990. She passed away in 2016. Sonequa Martin-Green is best known for her role as Sasha Williams in the television hit “The Walking Dead.” In 2016 she was awarded a role as a lead actress in “Star Trek: The Discovery” as a lieutenant commander of the USS Discovery, making her the first African American woman to lead the cast of a “Star Trek” ensemble. Martin-Green also has had recurring roles on television in “The Good Wife” and “Once Upon a Time.” A native of Russellville, Alabama, she graduated from The University of Alabama in 2007 with a bachelor’s degree in theater. In 1893 Bessie Parker and Anna Adams became the first two women admitted as students to The University of Alabama. According to a Tuscaloosa News story, both women were recognized as honors students with averages of 95 percent or better. In 1895 Adams became the first woman to graduate from UA, and Parker graduated in 1896. Parker and Adams also served on the staff of the first editorial board of the student newspaper, The Crimson White. The Parker-Adams living learning community at UA is named in their honor. Sarah Patterson was the head coach of the Alabama Crimson Tide women’s gymnastics team from 1979 to 2014. Patterson graduated from Slippery Rock State College in 1978, and she was named the head women’s gymnastics coach at The University of Alabama by then athletics director Paul “Bear” Bryant later that year. During her tenure, she built the program at The University of Alabama into one of the most successful in the history of college gymnastics, winning 29 regional titles, eight Southeastern Conference Championships and six NCAA Championships. She was named SEC Women’s Gymnastics Coach of the Year four times and the NCAA Women’s Gymnastics Coach of the Year four times. Patterson was inducted into the Alabama Sports Hall of Fame in 2003. In celebration of her career and six championships with Alabama, the Sarah Patterson Champions Plaza was built between Coleman Coliseum and Sewell-Thomas Stadium. Betsy Plank was known as a public relations pioneer, a champion of PR education and the first lady of public relations. A 1944 graduate of The University of Alabama, Plank attained national and international stature during a distinguished career in corporate and agency public relations. She achieved multiple firsts for women, winning many top awards in the field. The Public Relations Society of America Foundation established its first scholarship endowment fund in her name. Since then, the Betsy Plank Scholarship Endowment Fund has helped ensure the availability of public relations education funds for students at more than 40 colleges nationwide. In 2005, the Board of Trustees of The University of Alabama established the Plank Center for Leadership in Public Relations. The Center’s mission is to develop research, scholarships and forums that advance the ethical practice of public relations. Plank chaired its advisory board until her death in May 2010. In 2018, current UA student Maret Montanari was named by PRWeek as its Public Relations Student of the Year, the first UA student to receive this honor. Montanari serves as firm director of Capstone Agency, UA’s nationally affiliated, student-run, integrated communications firm. Montanari will graduate from the Capstone next spring. Montanari was not the only UA finalist at the PRWeek awards. For the eighth time in 10 years, The University of Alabama department of advertising and public relations was top five in the Education Program category. In 1970, Dr. Lena Prewitt became the first African American female professor to be appointed at The University of Alabama. Before making her mark at the Capstone, Prewitt received a fellowship to work with rocket scientist Wernher von Braun at NASA in Huntsville. Serving as the only African American on the team, Prewitt worked on Saturn V. According to a FOX news report in 2017, Prewitt said her time at NASA was good. But instead of continuing that route, she decided to follow her first love, which was teaching. She left NASA to teach at UA in what is now known as the Culverhouse College of Business. Prewitt also held teaching and administrative positions at Stillman College, her alma mater. In addition to those roles, she has been a noted speaker on manufacturing, education, equal rights and international relations, and she has served on advisory commissions in various countries. Representing excellence in all that she pursues, Dr. Catherine Johnson Randall earned two doctorates from UA and has been named one of the top 31 female UA graduates of the century. Randall was the first UA woman to serve as national president of Mortar Board, a national honor society for college seniors. She was also one of the first three women in the nation to be tapped for membership in Omicron Delta Kappa, a national honor society recognizing leadership, service to the campus community and academic excellence. Randall is a national leader in higher education. In 1978, Randall took the reins as the director of the Computer-Based Honors Program at The University of Alabama, which has become one of the most highly acclaimed undergraduate honors programs in the nation. In 2018, in honor of Randall and the program’s 50th anniversary, UA renamed the Computer-Based Honors Program the Randall Research Scholars Program. Randall is also a member of The Alabama Academy of Honor, which includes 100 outstanding living Alabamians. She also has headed the board of directors at the Alabama Women’s Hall of Fame. Julia Tutwiler, known as the mother of coeducation in Alabama, successfully lobbied the Board of Trustees of The University of Alabama to begin admitting women as students at the Capstone. She served as co-president of the Livingston Normal School (now University of West Alabama). She was also instrumental in the admittance of women to Auburn University and the creation of the University of Montevallo. Tutwiler was also a successful advocate for prison reform in Alabama, and she wrote the official state song.